Moving house seems like a horrible process we have created in order to punish ourselves for our overindulgence. I have now moved house three times with the same grey backless dress that I have never worn but seem convinced that one day I’ll wear/fit into/feel comfortable in/all of the above. Regular readers (hi mum and dad!) may notice the lack of posts in the last week and a bit and it is all due to the process of moving house. The silver lining is the fact my partner and I have purchased a house therefore, if we want, we don’t ever have to move ever again. Instead of flat packing boxes and storing them for the next move I am shoving them into the recycling bin with psychopathic delight. Not to say that moving house hasn’t involved any beer, quite on the contrary, beer has been very involved in the process – from the careful packing of special bottles I haven’t opened yet like a 2013 Cheeky Monkey Russian Imperial Stout and Boatrocker Mitte, a Berliner Weisse style beer, to drinking it to make the whole process a bit more bearable. Doing a task like this sober seems like an exercise in self loathing. We paired our packing with some 4 Pines Hefeweizen that we had purchased from our new local bottle shop after completing the final inspection of the house. I get the feeling that 4 Pines sales in the area are about to increase significantly. Having decided that going out for a bite to eat on Thursday night, the eve of the big move, was a really good idea we found ourselves at Swallow Bar in Maylands. A little live music and some of the best food I’ve had in recent memory, it was just what we needed to successfully procrastinate for the task at hand. Thank god for removalists, it was the first time we had paid other people to move our stuff and it was money well spent. 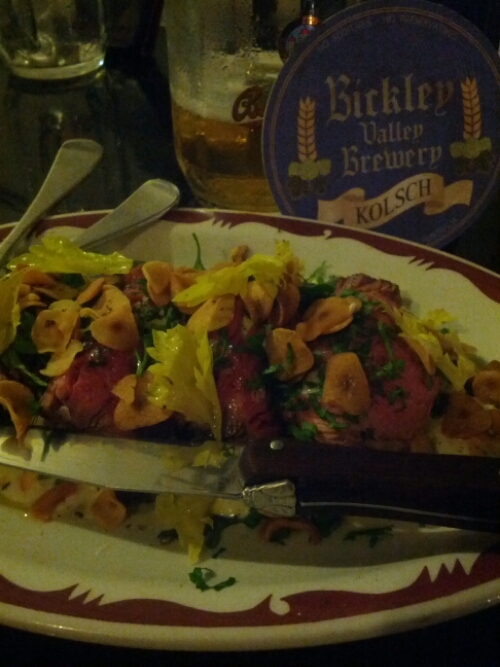 Oddly enough we didn’t crack any beers until late into the evening. 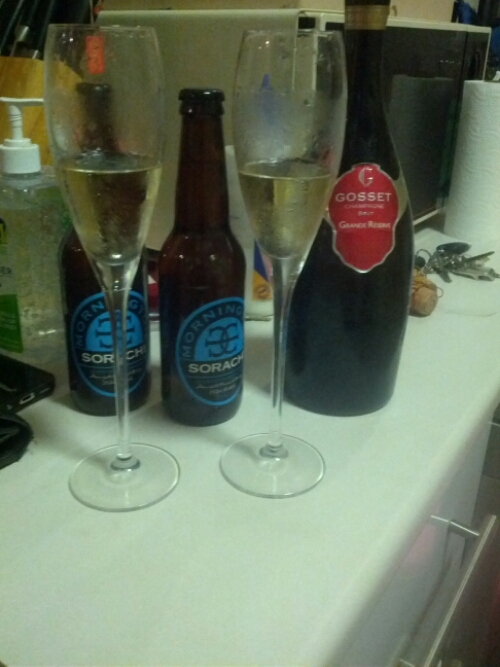 First we opened a bottle of Gosset champagne, my partners favourite, and then we enjoyed some Mornington Peninsula Sorachi, a gift from the guys at Mane Liquor where my partner stopped for celebratory booze. Having zero motivation for cooking on the night of said move I decided to try the local fish n chip shop which just so happens to be next door to the bottle shop. I popped in to get some 4 Pines Pale but they were down to their last three single bottles and after 16 hours of moving house it was definitely a 6 pack kinda night. Instead I got some James Squire Porter, a decision made on a whim and the fact it had been raining that day but I hadn’t factored in how much it did not go with fish n chips and how much I didn’t feel like anything remotely roasty. My brain was a little mushy at this point. Feral Hop Hog, a job so crap deserved a beer decidedly not so. This was our final farewell to renting as we mopped the last part of the floor and shut the door. How did we end up with so much stuff?! 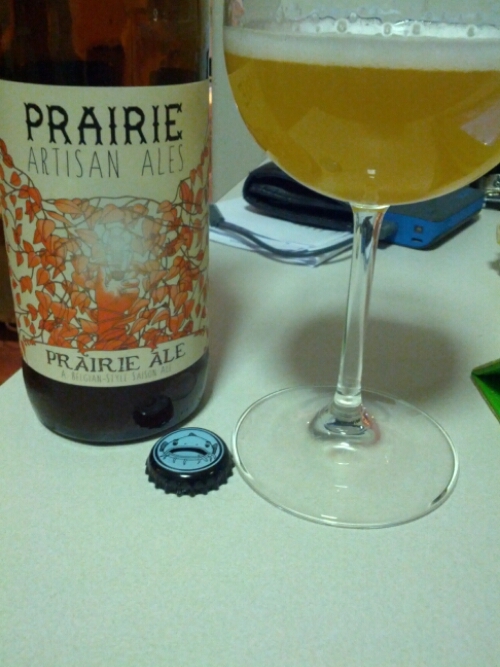 I decided to delve into our now unpacked and reloaded beer and dug out the Prairie Artisan Ale Prairie Ale, a Belgian style Saison Ale that felt like the liquid reward I had been hoping for. Initial thought was it was a funky lemon meringue pie, the smell on it was utterly gorgeous – cheesecake, sour fruit, citrus and straw, there was a lot going on but nothing overwhelming, like a really polite meeting where everyone gets to have their say.